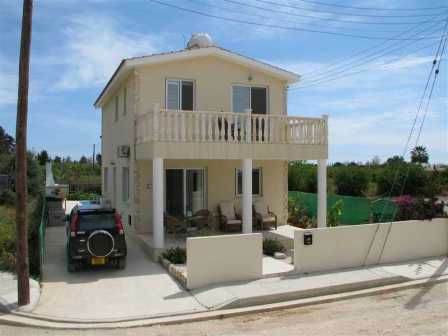 Cyprus Property Blog by Cleo : Agios Georgios Villa for Sale - Must Sell - NOW SOLD! • 125 sq. m., 3 bath, 3 bdrm 2 story - €280,000 EUR - Walk to tavernas& harbour - NOW SOLD! Agios Georgios, Paphos, Cyprus - This beautifully presented 3 bedroom villa is located in the stunning area of Agios Georgios in a quiet residential cul-de-sac a few hundred metres from the coastline. The local fishing harbour, shop, and a selection of restaurants and tavernas, are within easy walking distance, as is the beautiful conservation area of the Akamas Peninsula which is known for Cyprus’ finest scenery, fantastic walks and deserted beaches. The villa is very modern with high quality finishes throughout. The ground floor features a light and airy L-shaped living room with an attractive archway separating the lounge from the dining area and kitchen, and there is a guest cloakroom next to the central staircase. The kitchen is well equipped with built-in oven, stainless steel cooker hood, electric hob, washing machine, integrated dishwasher and American style fridge/freezer. In addition to providing lots of light, patio doors all around provide easy access to the outside. From the dining area is a raised covered terrace, and from the lounge is the rear garden with a purpose built barbecue at the side, and the swimming pool with roman steps. Upstairs a landing leads to three good size double bedrooms, all with fitted wardrobes, and a family bathroom. The master bedroom has an en-suite shower room and patio doors leading to a private balcony from where you can see the sea. In summary, the property is in tip top condition, and situated in a prime location. Great value for money.